Three flours that sustained life on the Atlantic seaboard for centuries. Commonly grown as a crop mixture in the field. Mixed and cooked into tasty bannocks in the kitchen. Decline to near extinction in the 20th century. Now with a great future as sustainable low-input crops, bringing diversity to the farmed landscape and healthy, nutritious food. Peas, bere (barley) and oats have been a staple plant mixture giving protein and carbohydrate through the centuries of farming on the Atlantic seaboard. Yet in Scotland, as in much of Atlantic Europe, their role diminished within living memory. Peas declined in area from the mid 1800s to to almost nothing in the 1930s. Bere dropped out of census records in the 1880s but was then nearly lost except in a few northern fields. Oat fell from being the dominant grain crop over the last few hundred years to covering less area than barley and wheat by 1950 . Their decline is now being reversed. Bere grain (left), marrowfat peas and oat grain (right): bear and oat grown in the Living Field garden, peas from a packet (www.livingfield.co.uk). Traditionally peas along with bere and oats, and sometimes beans, was the staple protein food of the rural working population in Scotland. They were the local pulse and grain – the sustaining combination of plants that once fed the world and still feeds large parts of it. Fenton’s Food of the Scots  cites many records from the 1400s to the late 1800s of peas, beans and cereal grains grown alone or in mixtures. Similarly, the flours of peas, oats and bere were eaten as bread and bannocks, either as sole constituents or baked in combination. The pulse crops were certainly recognised and widely appreciated here for hundreds of years. 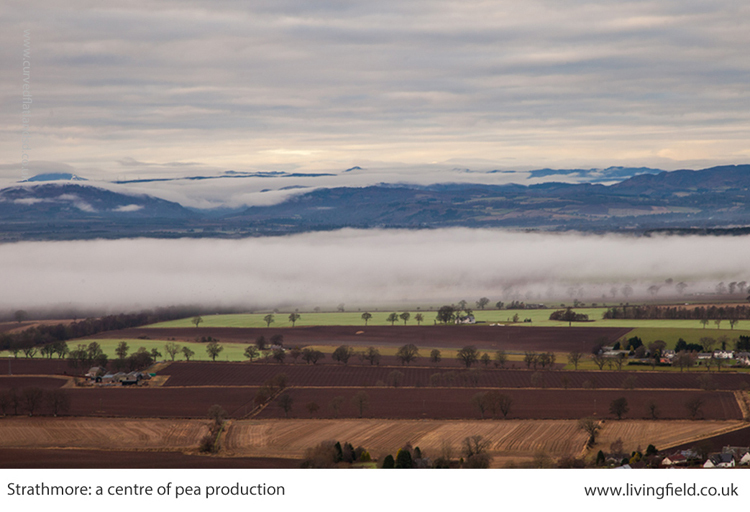 A 1426 Act of Parliament in Scotland stipulated that a farmer should sow 1/12 of his labour in peas , not just for protein food but to fertilise the soil with nitrogen (though the process of biological nitrogen fixation by legumes was not understood until many centuries later). The products of peas and beans were grown locally, traded across the country or imported by sea, often from nearby Atlantic and Baltic ports. Though peasemeal was demeaned as a food of the labouring classes in some regions, the inclusion of peas in the subsistence diet was recommended by Hutchison in 1869  as contributing to a healthier and longer life for the rural worker and their family. The records cited by Fenton indicate peas as a crop and food were more important here than beans Vicia faba. Yet by the mid-1800s, that order was reversed. At the first crop census in 1854, beans occupied 6 times more area than peas . The cause of the decline of peas as a crop is suggested by MacDonald (1908) as due to ‘the extended use of potato’ in the subsistence economy  and by Porter (1925) to the replacement of pulses by clover and grass mixtures  that are better at maintaining soil fertility. Well into the period up to the 1950s, both pulses were named individually in the census and classed as grain crops to be harvested like cereals, yet unlike the cereal grains, they continued to decline in area despite a short-lived revival in the late 1940s (when food imports and nitrogen fertiliser were restricted). Peas became a minor crop by the 1930s and disappeared from the annual census in the 1950s. Beans went a decade or so later. They covered too small an area to be recorded in the annual summary. They reappeared gradually from the 1960s in different forms, such as ‘vining peas’ for human consumption, but that’s another story, and despite a rise in sown area similar to that of the 1880s, peas and beans together now cover 1-2% of the cropped surface, a very low percentage. The benefits of all three products – peasemeal, beremeal and oatmeal – to health and environment are increasingly recognised today. Here, we wonder what peasemeal-beremeal-oatmeal bannocks tasted like and decided to find out. Grain – top bere, middle peas, lower oats – is ground to beremeal, peasemeal and oatmeal, which are mixed with water, pressed on dry meal into a round, 1 cm thick, and heated in a pan until the bannock is cooked golden brown. For much of recorded history in these islands, wheat was not as widely grown as oats and barley, and when it was grown or imported, it was more to feed the wealthy. Beremeal and oatmeal do not ‘rise’ much by themselves, so were most commonly eaten as bannocks, a form of flatbread . The flours were mixed with water, patted into a round, typically 1 to 2 cm thick, and baked on a hot surface on or by a fire. To try out the method, flours were sourced from water-powered mills at Golspie in Sutherland and Birsay on Orkney . Then trial and error – peasemeal and oatmeal, peasemeal and beremeal and all three together, the latter preferred for the blend of tastes. The oatmeal was medium-ground and gave some granularity to the mix. The peasemeal had a yellowish colour, while the beremeal was more of a light brown than a standard refined wheat flour. On the packets, peasemeal had a protein content of 20.4% and oatmeal (as most unrefined cereals) around 13%. The three were placed in a bowl at about 1:1:1, or slightly more oatmeal than each of the other two, mixed into a thick paste or dough with water, turned out onto the board with a little beremeal on it to stop it sticking and then pressed into a bannock (about 10 -15 cm wide and 1 cm thick). It took 10 to 15 minutes to cook the bannock slowly in a cast iron pan, very lightly oiled with cold-pressed rapeseed, though oiling is not essential. 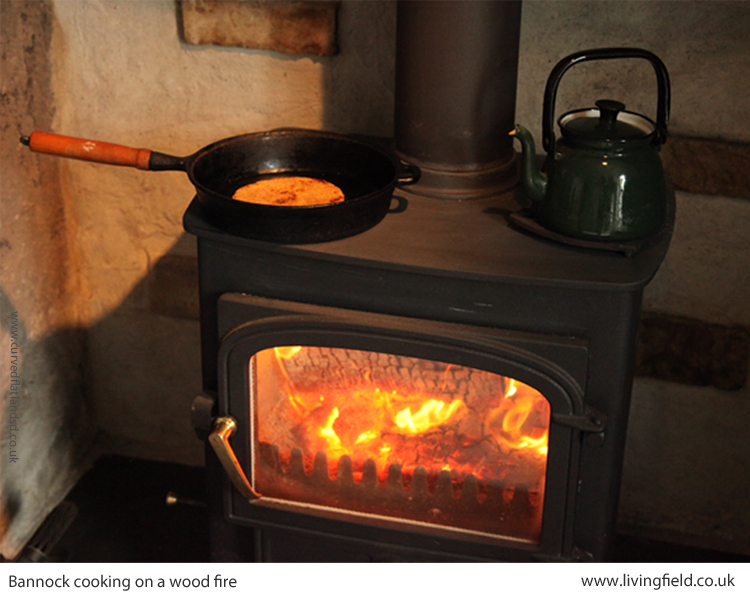 Heat sources tried were a modern gas stove, an indoor wood stove and an outdoor fire. The three-meal bannock was tasty and filling, eaten with butter or marge (could try a drizzle of oil), marmite, various cheeses and dipped in soup. A satisfying experience. Pea Pisum sativum is now grown in various forms, for animal feed, for canning and freezing to feed people and as a fresh vegetable. The peas traditionally used for peasemeal or flour tended to be marrowfat or similar types, harvested when mature [but see note 4]. Peas need no nitrogen fertiliser and less pesticide than most non-legume crops. Bere, the traditional landrace of barley Hordeum vulgare, is now grown only in a few localities, but appears to need less fertiliser and pesticide than modern two row barleys. Oats Avena sativa were overtaken by barley in the middle to the 1900s as the Scottish cereal crop of choice, but they too need less pesticide and fertiliser than barley and recently oat yields have increased to rival those of spring barley. Oat is also nutritionally superior to barleys and wheats. Many records over recent centuries describe the growing of two or three crops mixed together in one field. 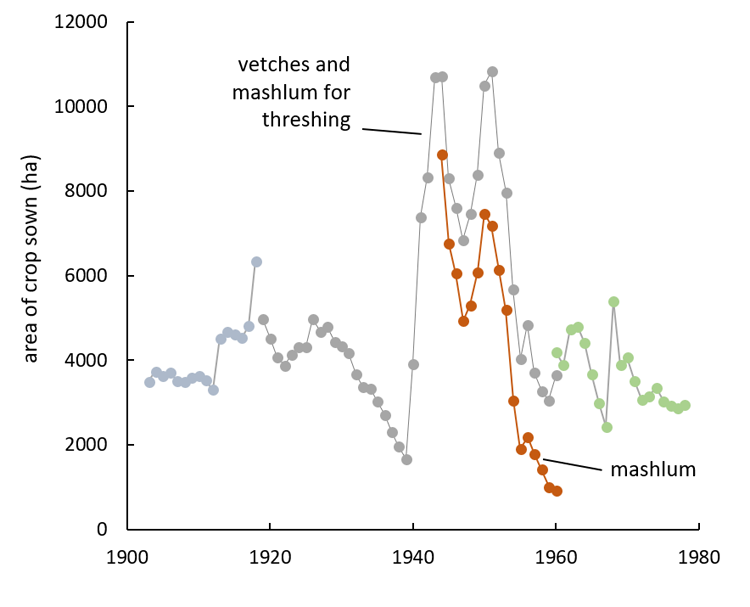 ‘Mixed grains’ was recorded in the crop census for most of the 1900s, while mashlum – a mix of peas or beans with oat or barley – was common enough to be cited as a distinct crop category from 1944 to 1978 . As related elsewhere on the Living Field web site (see Mashlum – a traditional mix of oats and beans) these crop mixtures disappeared from the census records but are still grown by a few farmers who value their contribution to fertility and nutrition. 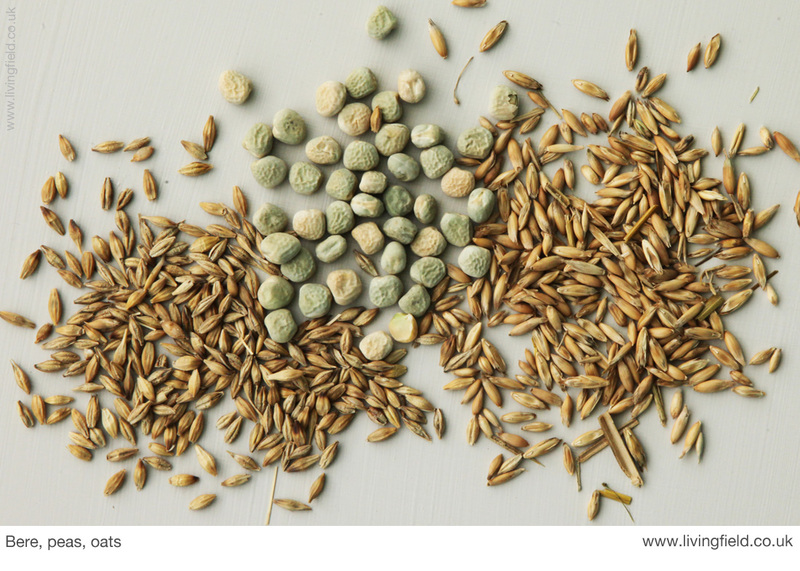 The yields, nutritional content and environmental benefit of traditional landraces and mixed grains are being researched and quantified at the James Hutton Institute, Dundee [6, 7}. 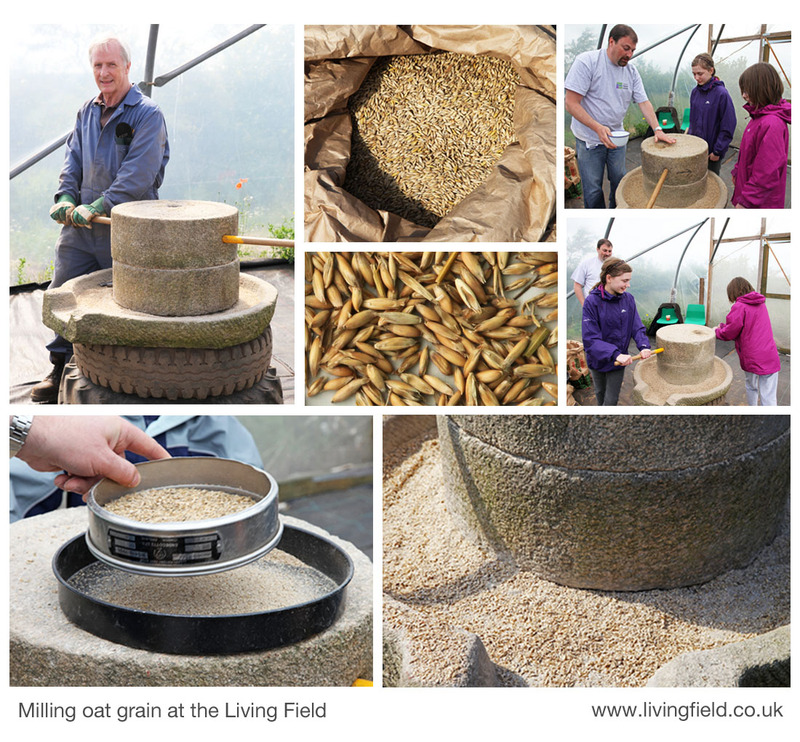 The Living Field bought its own hand-powered corn mill a few years ago. It consist of a stone base and two grinding stones. The latter were honed by Mr Roberts from the Hutton’s workshop and the whole was supported by old tyres. Grain (in this case oats, centre top) is fed into a vertical channel in the upper stone and falls down through to the gap between the stones. The stones are turned by the wooden rod, as shown by Mr Young and two visitors at an Open Day (this one in 2012). The grain is ground between the stones to a mix of meal and bran (the husks of the grain) which gets pushed out and collects in the stone base from where it is brushed off into a container (lower right). The meal and bran are separated by hand using a sieve (lower left). At Living Field open days – at Open Farm Sunday for instance – visitors can see the whole process from growing the plants from seed, harvesting grain, grinding the grain and separating the meal from the chaff. Gill Banks shows how to make bread from the flour made from these ancient varieties. Census records for the main crops began in 1854, then continued from the early 1880s through to 1978 as Agricultural Statistics Scotland, a fine source of information. Yearbooks are available online from the Scottish Government web site at Historical Agricultural Statistics. More on the 1854 census on the LF site at Thorburn’s diagrams and Bere country. Fenton A. 2007. The Food of the Scots. Volume 5 in A Compendium of Scottish Ethnology. Edinburgh: John Donald. Peas, peasemeal and bannocks appear in Ch 17 Bread and Ch 14 Field crops. Fenton cites: MacDonald J (1908) Editor of Stephens’ Book of the Farm for the loss of peas in preference to potato; and Hutchison R (1869) Report on the dietaries of Scotch agricultural labourers, (Transactions of the Highland and Agricultural Society, 4th, 2, 1-29). Porter J. 1925. The pea crop. In: Farm Crops, Ed. Paterson WG, The Gresham Publishing Company, London. Sources of the meal. Golspie Mill in Sutherland makes a range of flours and meals including the peasemeal ‘made from roasted yellow field peas’ and the oatmeal used here. Barony Mills at Birsay, Orkney makes the beremeal. Barony have appeared many times on this web site e.g. at Landrace 1 – bere. Suppliers who stock these products include Highland Wholefoods in Inverness. The Living Field is publishing, in 2018, articles, notes and photographs on crop mixtures as part of its Crop diversification series. The first post is Mashlum -a traditional mix of beans and oats (though mashlum can be any combination of pulses and grains). The James Hutton Institute carries out a wide range of studies on pulses and grains. The nutritional and environmental properties of pulses and pulse-grain mixed crops are examined in the EU H2020 TRUE project, coordinated from the Hutton Institute and with many partners across Europe. For further info, see TRUE Project EU and articles on the curvedflatlands web site at Transitions to a legume-based food and agriculture. 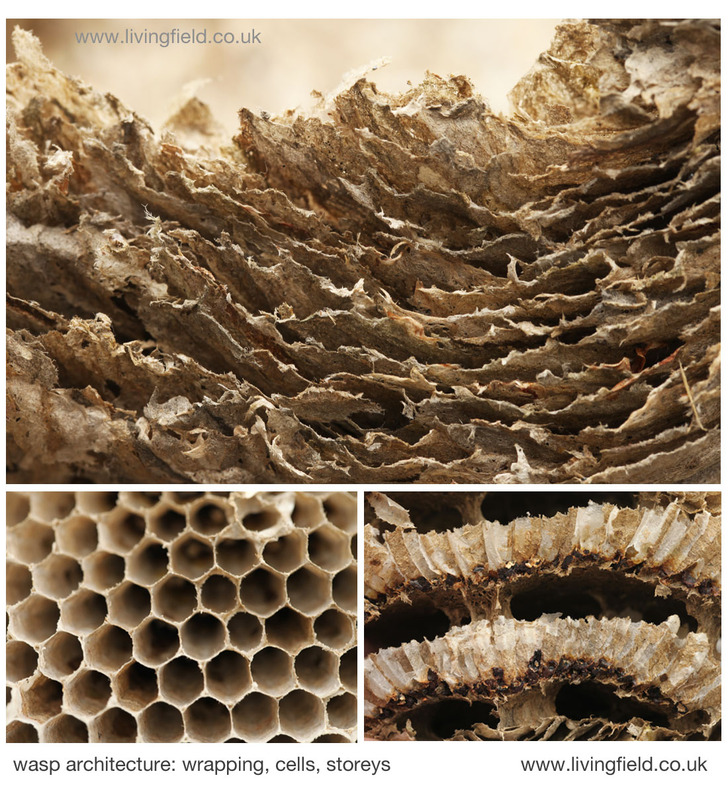 Contact at the Institute: pete.iannetta@hutton.ac.uk. In collaboration with the University of the Highlands and Islands Orkney College and University of Copenhagen, Denmark, The James Hutton Institute does research on promoting the use and value of bere barley http://www.hutton.ac.uk/news/understanding-living-heritage-bere-barley-more-sustainable-future. The agronomy, genetics and unique physiology of bere barley are studied with specific reference to micronutrient efficiency and potential environmental benefits. Contact tim.george@hutton.ac.uk or joanne.russell@hutton.ac.uk. The page on the Bere line (rhymes with hairline) gives links to comments, images and articles on bere barley, including our correspondent Grannie Kate‘s recipes and experiences using bere meal and our Gill and Co’s breadmaking with various ingredients at Bere and cricket. Author and images: geoff.squire@hutton.ac.uk; information on sourcing the grinding stones and growing bere, peas and oats in the Living Field garden, gladys.wright@hutton.ac.uk. The Living Field web site Editor, normally averse to the alchemy and incantations of cooking (best left alone!) managed to make (and eat) bannocks from the constituents bought from the sources indicated at . Peasemeal brose is even easier – just add hot water to a couple of teaspoonfuls of peasemeal, stir and eat with toast or dips. Caution – beware the three-meal bannocks are addictive. Reconnecting with primordial tastes? The Living Field has been studying and promoting the diversity of crops and cropping methods since its beginning over 15 years ago. The Garden displays the different crops grown since the first farmers arrived here thousands of years ago. 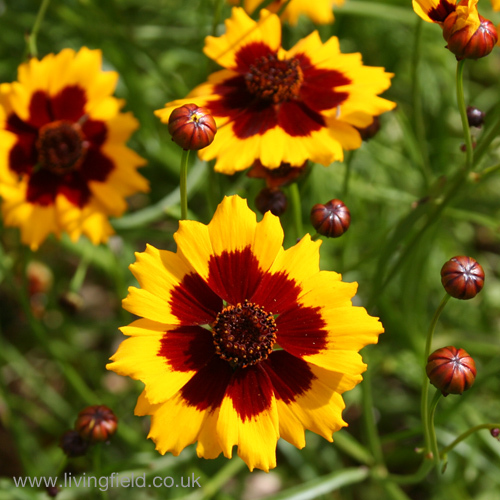 The Garden’s habitats also harbour and attract a range of wild plants that have themselves been nurtured and harvested in the wider landscape. Why diversification? Many of our crops have been lost in the march to uniformity and many wild plants are threatened by loss of habitat. 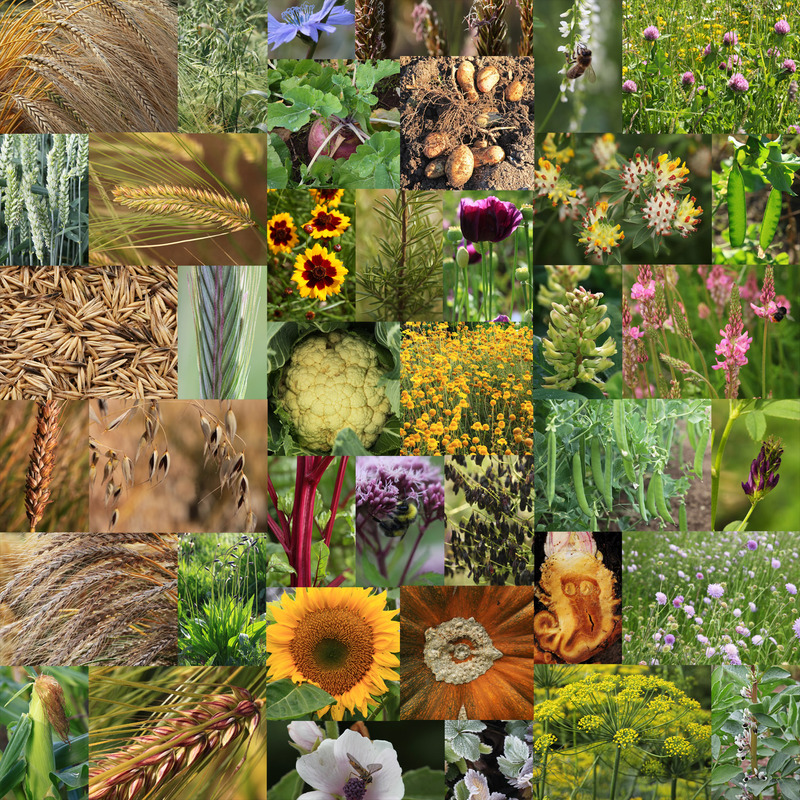 Plant diversity in the croplands has decreased in the last 150 years. Yet there is a drive to reclaim this heritage, to diversify agricultural fields and landscapes for the betterment of the environment and human nutrition. What does crop diversity do? Each type of plant uses the resources of sunlight, water and nutrients to form its body, including the things we take off it as yield – grain, leaf, root and so on. Each type takes up, uses and passes on these resources in slightly different ways. They open or close channels through which the resources flow – some to us in the form of nutritious food, some to the soil and some to food webs and wildlife. 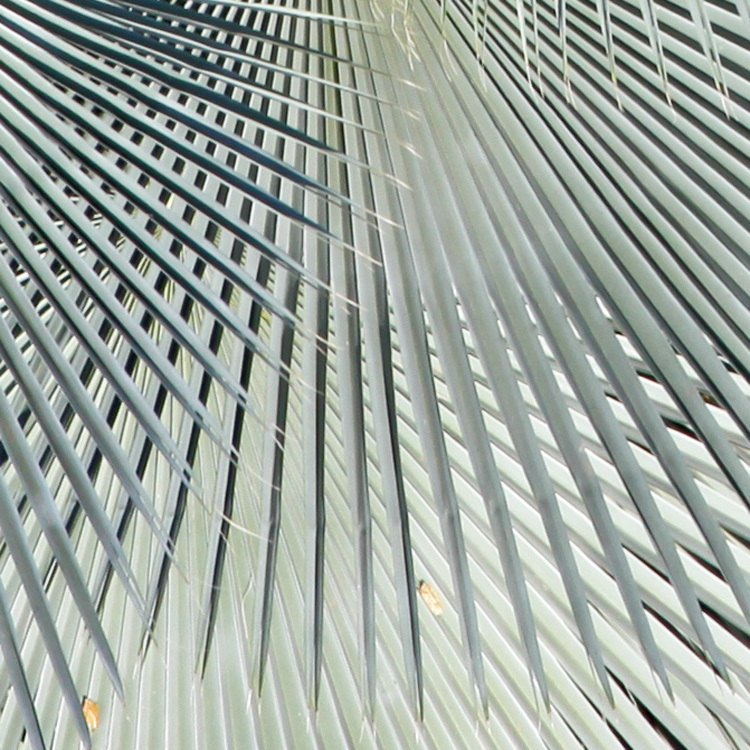 A single type of plant can open only a small number of channels – it blocks the others off. Therefore many types need to be grown together to ensure that all the channels necessary for the ecological wellbeing of the land are open and working. Therefore as plant diversity declines, channels are closed and the ecosystem malfunctions. An example is the decline of legume crops and wild plants such as peas, beans, vetches and clovers. 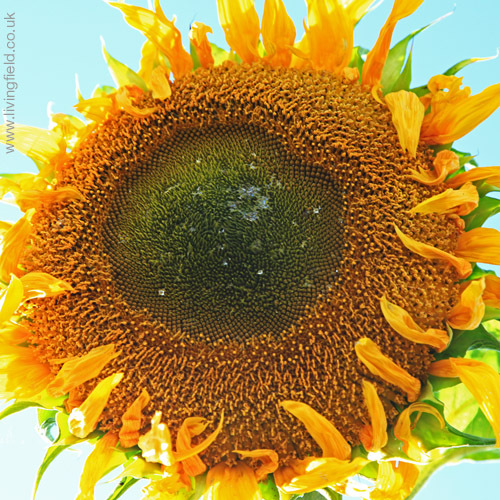 They fix their own nitrogen (an essential plant nutrient) and so do not need to be given mineral nitrogen fertiliser (which, apart from helping plants to grow, can be a damaging pollutant). There has been a trend in the last 150 years to reduce the diversity in crops and grass which have together sustained people here since the neolithic age 5000-6000 years ago. The changes have not been abrupt, but they accelerated after the 1950s due to the higher yields that were achievable using mineral fertiliser and pesticide. Barley is now dominant, whereas many other types have declined or disappeared. The tuber crops such as turnips, swedes and potatoes, the legumes such as peas, beans and vetches, and the dyes and fibres have all declined in area in the last 150 years. Some such as the fibre crop, flax, or the dye plant, woad, are no longer grown. Along with increasing use of pesticide, these changes have limited the channels through which natural resources flow to sustain the ecosystem. They have reduced farmland wildlife and in some cases endangered the capacity of soil to sustain life. But while food security was assured in the 1960s, perhaps for the first time ever, agriculture then became geared to the manufacture of drink and animal feed, while the people living here came to rely on imports for food. The croplands are out of balance! There are increasing and welcome pressures to re-diversify agricultural land for the benefit of all forms of life that rely on it. The pressure certainly comes from many small enterprises and businesses involved in creating a sustainable and healthier food system, but pressure also comes through European Union influence. Notably, funding from the EU has enabled researchers at the Hutton to collaborate and share knowledge and practice of diversification with scientists and innovators throughout Europe. 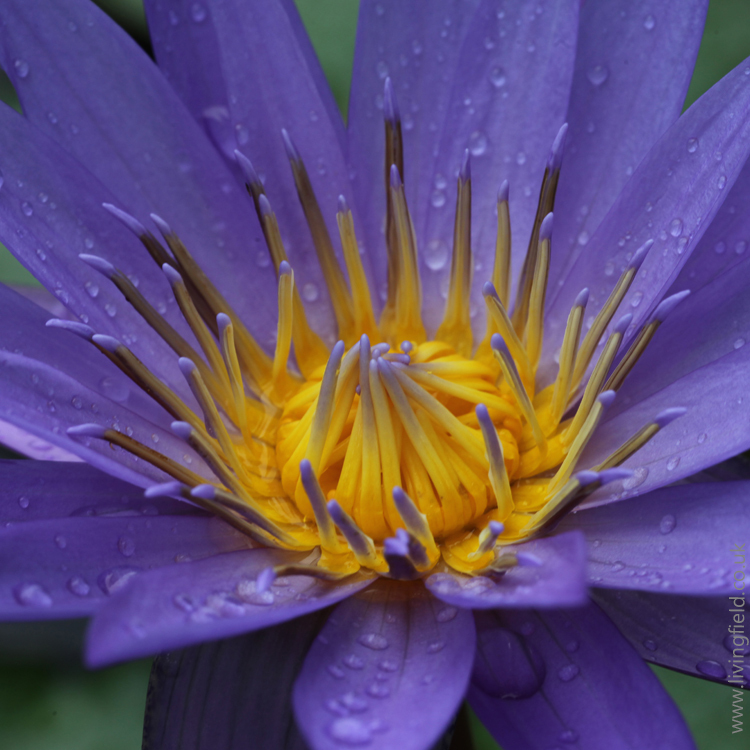 the methods that can be used to restore and maintain diversity in the field and landscape. The work and practice in crop diversification by the Hutton farms will be noted in parallel to Living Field articles on our LEAF Linking Environment and Farming web site at Hutton/learning/leaf. Links to specific web pages will be given later. The Living Field garden will continue to grow and display many of the crops and useful wild plants that sustained people here since the last ice. 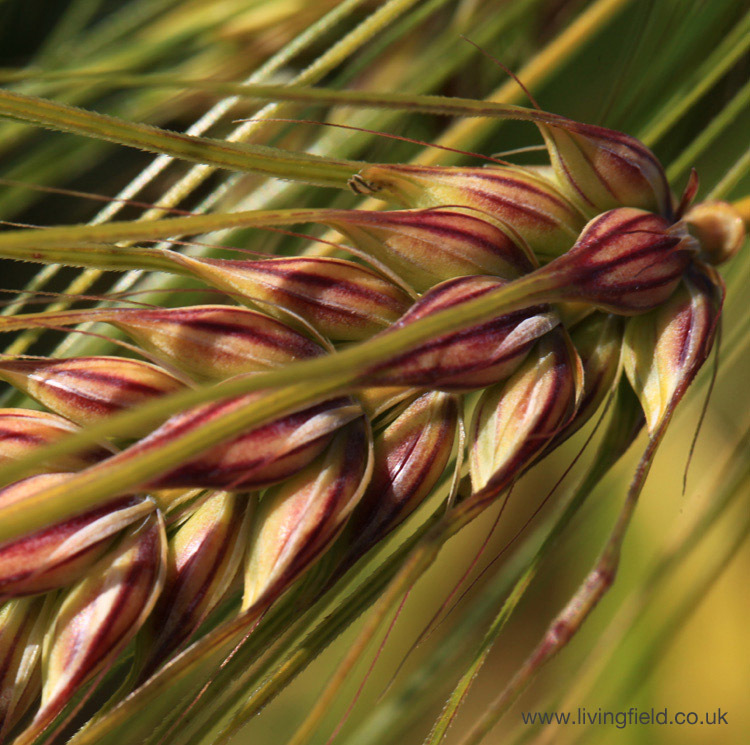 Bere barley – one of many cereal (grain) crops at the Living Field garden. 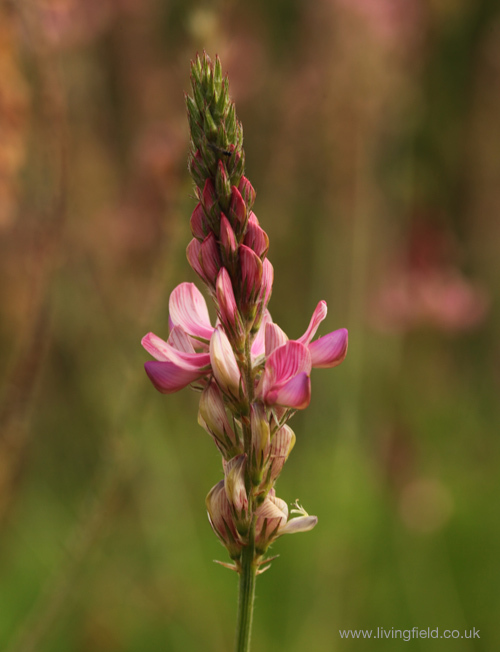 Sainfoin Onobrychis sativa – one of the many legumes at the Living Field garden. A note in the Bere-line – a survey of bere barley, an old corn landrace. Distribution of bere and barley in the 1850s: bere to the north and west, barley to the east and centre. Loss of bere and many other crops from the late 1800s. Declines in crop diversity. Previous notes in the bere-line compared bere barley and the improved two-row barleys in several collections and census records from the 1800s. By the 1850s, bere was still recognised and catalogued in terms of several variants  but most named types of barley were of the two-row form. In the crop census of 1854 [2, 3], itself a milestone in the description of agriculture, bere occupied about 10% of the area of barley, but was still recorded throughout the country. The census of 1854 was based on the pre-1890s counties, administrative areas that had been in existence, though not unaltered, for many hundreds of years [4, 5]. A map of the counties is shown at Sources below. The areas sown with bere and barley in 1854 are shown in Fig. 1. The centre of each circle is positioned near the centre of one of the old counties. The map is partitioned into present administrative areas . The area of each circle represents the relative area of crop in each county. The largest circle in the bere map is about 3000 acres (1,200 hectares) while the largest on the barley map is 28,000 areas (11,300 hectares). The map appears to show no or little bere or barley was grown in the western islands, but they were part of mainland counties at that time, so the crops grown there were included within circles located on the mainland. Fig. 1 Distribution of bere (left) and barley (right) from the 1854 census, each circle representing the area of crop in one of the pre-1890s counties. The largest bere circle is about ten times smaller than the largest barley. The dashed line near the top indicates Shetland is displaced downwards in this depiction. Orkney and Shetland formed one area in the census: bere on the left represented by the large circle just above Orkney; the arrow on the right pointing to the small area grown with barley. Click on the map to see a larger image. Original map outline from . Source of data . 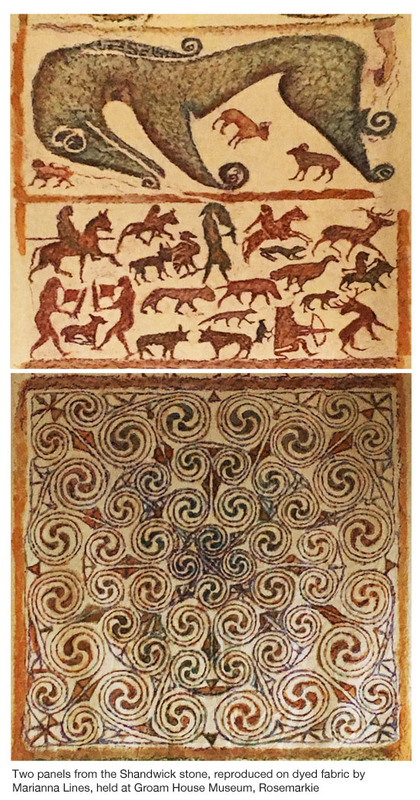 The distribution of bere confirms it was grown country-wide, from the Borders to Orkney and Shetland. Yet the areas sown to bere were very small in counties to the east and south east. It seems to have almost faded out in these places but remained strong in the north in Caithness, in the south-west in Argyll and in the northern islands, Orkney and Shetland. Bere was therefore grown in colder, wetter climates and poorer soils than could be profitably grown with the two-row types. At this time, barley was the preferred crop in the east central and south east, which are now the typical, high-yielding grain producing regions of the country. Barley was not the major cereal in the 1800s. Oat was still grown over a much greater area. But the regions occupied by barley in the 1850s are those in which it rose to dominance in the period 1940-1960 to become by far the most widely grown cereal. One of the main difficulties with charting the fall of bere is the absence of reliable records before and in the early 1800s. Even its decline into the early 1900s is obscure because barley and bere were combined in the annual census of area and yield . The reasons for bere’s later decline to near extinction are uncertain and would have differed between regions. The improving two-rowed barleys were probably easier to manage and more reliable yielders than bere in most parts of the country. There were regional variations – in Shetland, for example  the barleys as a whole declined fourfold from 1890 to 1930 and then continued to fall due to a rise in rotational grass and sheep. Many changes occurred in the 150 years from the 1854 census, including major reductions of other crops – other than grass – grown for animal feed, including turnips and swedes, forage (leaf ) brassicas, grain legumes and mashlum, a traditional crop mix of oats and beans . The loss of bere was part of that change. Yet bere did not die out. This traditional landrace is still grown and finding high-value uses in food and drink [9, 10]. There’s hope still – buy some bere meal and get cooking! Author/contact: geoff.squire@hutton.ac.uk. Gladys Wright and Jackie Thompson grow the bere and barley crops in the Living Field Garden. Lawson and Sons synopsis of the vegetable products of Scotand: Bere in Lawsons synopsis of 1852. Thorburn T. 1855. Diagrams, Agricultural Statistics of Scotland for 1854. London: Effingham Wilson. 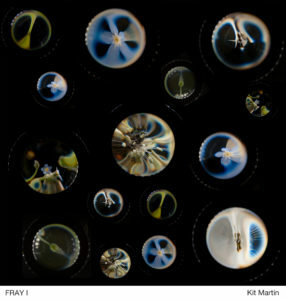 More at this Living Field article on Thorburn’s Diagrams. Original available in part through the web. Shires of Scotland (Scotland historic counties before 1890) https://en.wikipedia.org/wiki/Shires_of_Scotland gives the history of the counties and map. 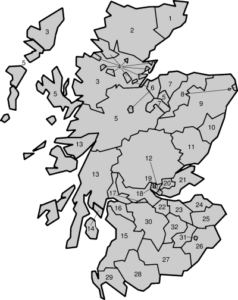 The map opposite showing counties by number, except Orkney and Zetland (as it was then named) is from Undiscovered Scotland at Scottish Counties until 1890. Scotland map, outline with modern administrative regions: www.d-maps.com, free map, edited by the author. Agricultural Statistics 1912. 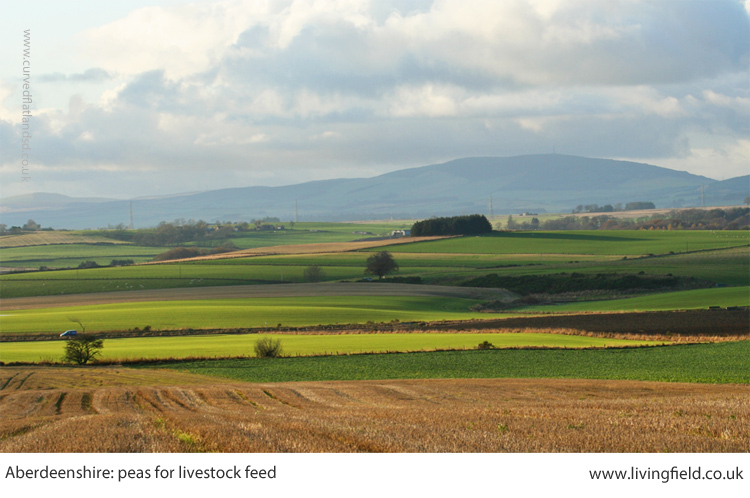 Acreage and live stock returns of Scotland. Board of Agriculture for Scotland. HMSO. A useful starting point since it gives crop-areas back to 1902. 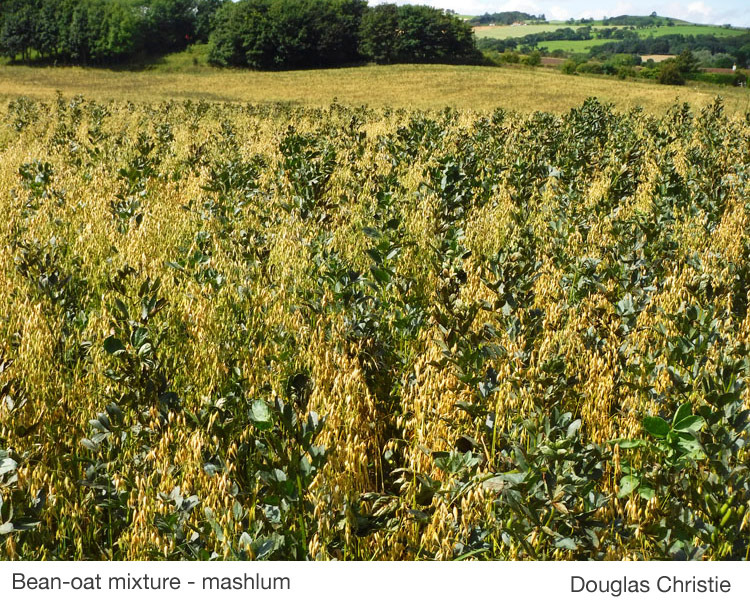 Bean-oat or pea-oat mixed crop – an article on the Living field web site at Mashlum – a traditional mix of oats and beans. 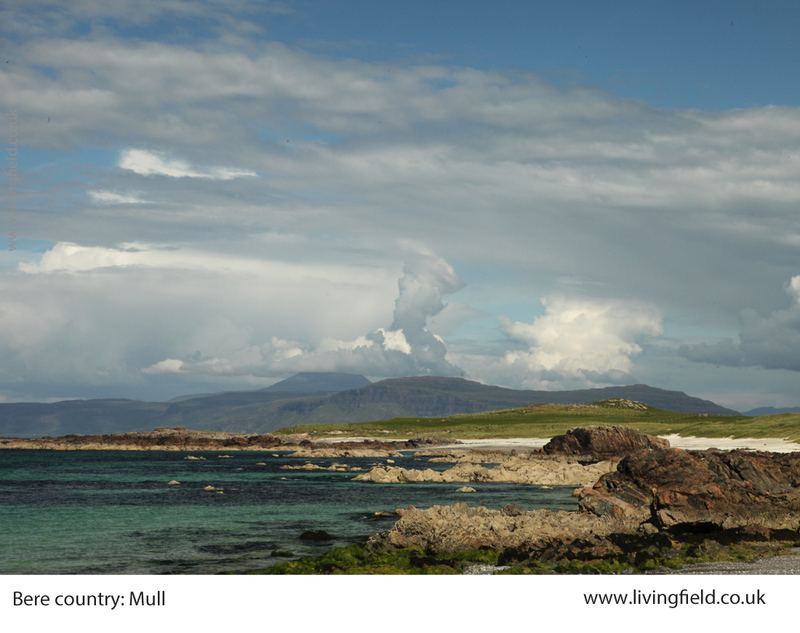 See Barony Mills’s web site for preparation and uses of bere meal: http://www.birsay.org.uk/baronymill.htm. 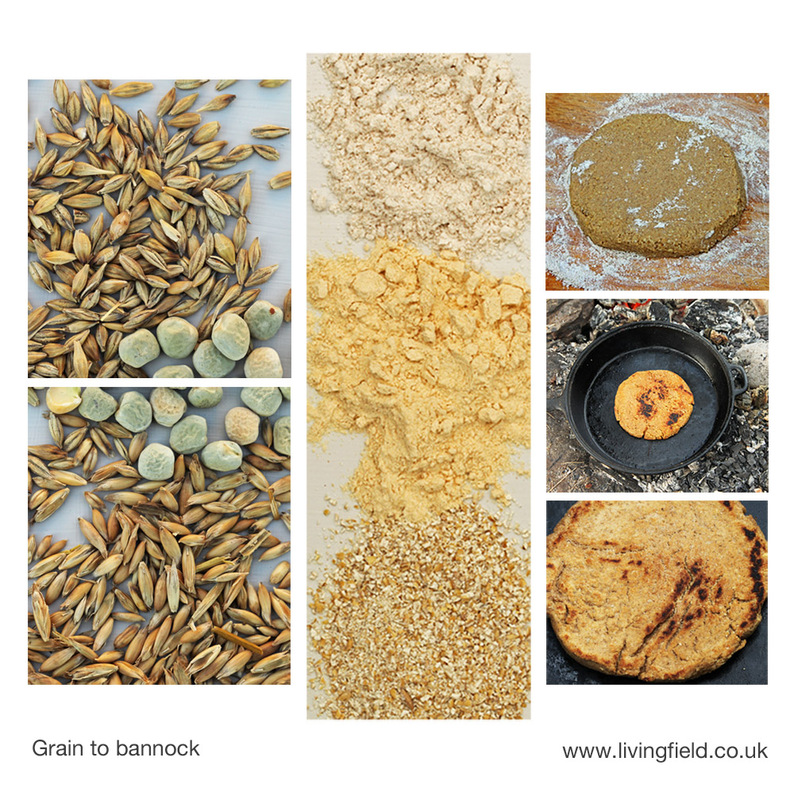 The Living Field web site offers several of Grannie Kate’s recipes for bere meal, usually mixed with other cereals: seeded oatcakes with beremeal, bere bannocks, bere shortbread and bere scones. For a summary of cereal growing on Shetland, its decline and potential: Martin, P. 2015. Review of cereal growing in Shetland. Agronomy Institute, Orkney College. 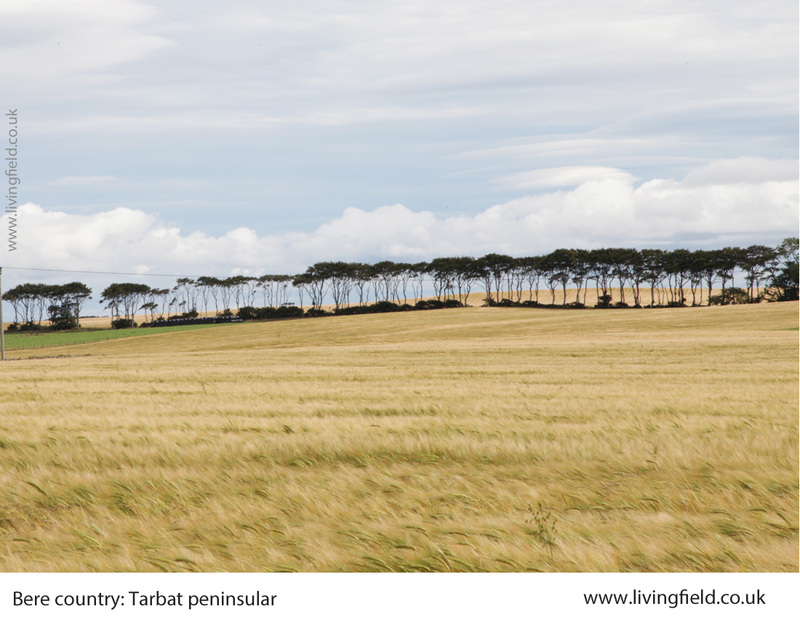 To find the PDF online, search for ‘cereal shetland agronomy institute 2015″. The bere line – rhymes with hairline : summary of all links to bere on this site. 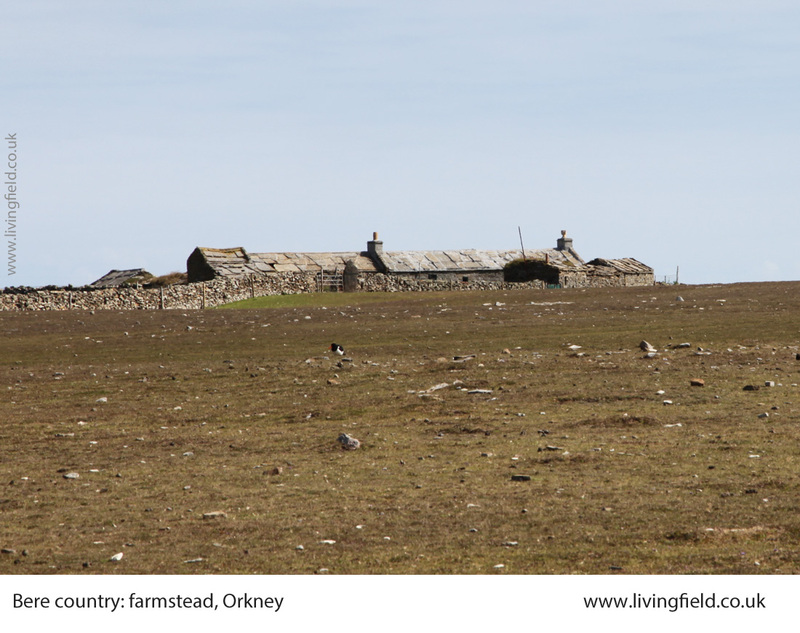 Landrace 1 – bere : notes on the barley landrace and crops on Orkney. 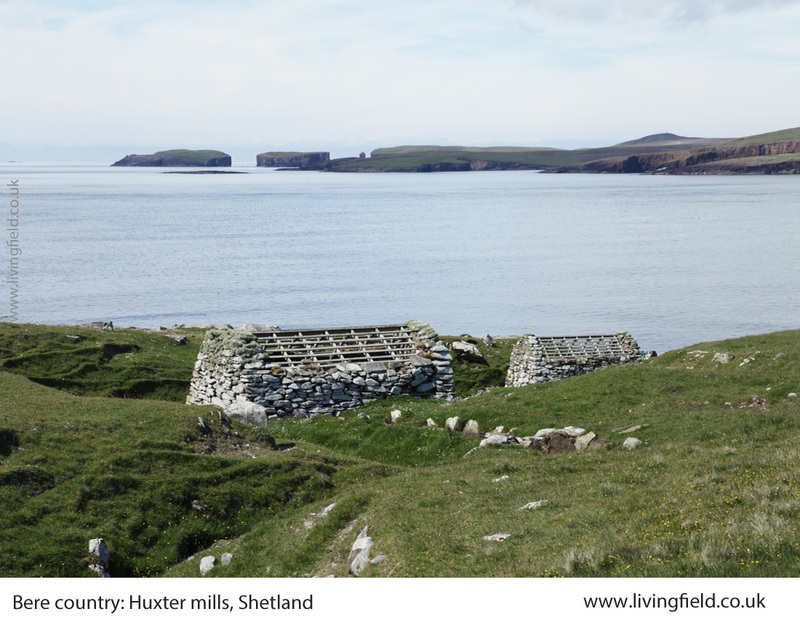 The horizontal water mills at Huxter: Shetland’s horizontal water mills.